The T-34/76 was designed in 1940 as a multi-purpose vehicle, intended to take advantage of breakthroughs in enemy lines. It kept the original F-34 gun until 1943, despite the appearance of many new AT gun types, new versions of the Panzer IV with a high-velocity gun (which became the German primary tank) and the appearance of many tank-hunters based on obsolete tank chassis, such as the StuG III, an assault gun built on the Panzer III chassis. After reports about the new Russian tanks had reached the OKH, German engineers were sent back to the drawing board under the pressure of many generals and the full support of Hitler himself. From their work emerged two new models, the Panzer V “Panther” and the Panzer VI “Tiger”. Both the T-34 and the KV-1 combined excellent armor with a potent gun, while the T-34 also had great mobility and was easily mass-produced. The Panther had its origins deeply tied to the T-34, with all lessons from the Eastern Front well learned. It combined sloped armor, superior in thickness to the Russian tank, large tracks with new interleaved wheels to ease ground pressure, better optics and the KwK 42 gun. At the same time, the Tiger combined thick armor with the devastating power of the 88 mm (3.46 in) gun. The Russians didn’t wait for the German response. By 1942, the Panzer IV Ausf.F2, armed with a high-velocity 75 mm (2.95 in) gun, was already a threat and triggered reports which were well-known inside the Stavka. The Soviet Main Directorate of Armored Forces (GABTU) ordered the Morozov Design Bureau to go back to the drawing board and his team created the T-43, combining a reshaped hull with increased protection, torsion beam suspension, a brand new gearbox and a new three-man turret with a new all round vision commander cupola. 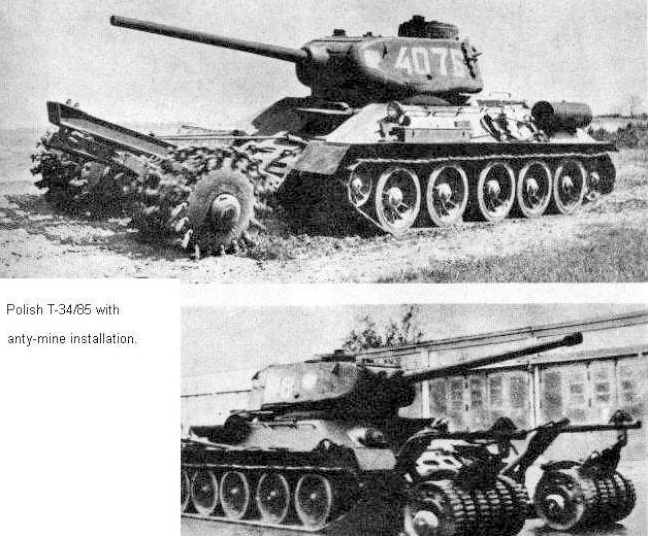 The T-43 was four tons heavier than the T-34/76 and it was seen and conceived as a replacement for both the KV-1 and the T-34, a “universal model” aimed at mass-production. The T-43 suffered some delays due to having a low priority. Uralvagonzavod delivered the first two prototypes in December 1942 and March 1943. The T-43 shared, to ease production, a major part of its components with the T-34, including its 76.2 mm (3 in) F-34 gun. However, the tests performed at the Kubinka proving grounds showed that the T-43 did not have the required mobility (it was slower than the T-34) and, at the same time, could not resist an 88 mm (3.46 in) shell impact. However it had a better ride and gearbox, and the new turret was widely appreciated by the crews, which in the end earned it approval for pre-production and service in the Red Army. But it was clear after the first reports came from the battle of Kursk, seeing the heavy losses taken by the T-34, that the 76 mm (3 in) gun was not up to the task of taking on the up-armored German tanks, who could in turn out-range the Russian tanks with ease. So while making production top priority, the decision was taken to favor firepower over protection. And since the new turret of the T-43 was not designed, at first, to house a bigger gun, the T-43 project was judged obsolete and dropped. 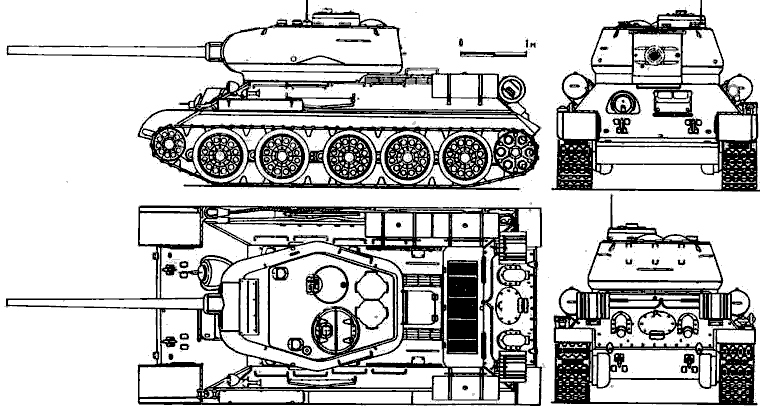 4-view drawing of a T-34-85. The State Defense Committee met on August 25, 1943, following the battle of Kursk, and decided to upgrade the T-34 with a new gun. The T-43 was dropped in order to not have to completely retool the production lines relocated at such great price to the foothills of the Ural mountains. But at the same time, this posed a real challenge to the engineers, whom had to conceive a new turret capable of housing the long barreled 52K model 39, the standard anti-aircraft gun of the Red Army at the time, without touching the lower part of the tank, chassis, transmission, suspension or engine. Choosing this gun was a bold move, clearly influenced by the heavy toll imposed by the German 88 mm (3.46 in) on every front since the beginning of the war. In the endless race between firepower and protection, it became apparent that no engine of the time could give a tank, with sufficient protection from the German 88 mm (3.46 in), the minimal mobility requirements put up by the Red Army. The original T-34/76 seemed to have the perfect balance of speed, armor and firepower at first, but since by 1943 its firepower was limited and something had to be changed, protection was sacrificed. On the other hand, keeping the T-34 virtually unchanged except the turret could provide the assurance of a quick transition, almost uninterrupted, between the two types, which was just what the Stavka required to keep the edge in terms of numbers. The M1939 (52-K) air-defense gun was efficient and well-proven, sporting a 55 caliber barrel. It had a muzzle velocity of 792 m/s (2,598 ft/s). General Vasiliy Grabin and General Fyodor Petrov directed the team responsible with the conversion, initially into an anti-tank gun. Soon it appeared ideally suited for a tank, and the first to use a derivative model, the D-5, was the SU-85, a tank destroyer based on the T-34 chassis. This was an interim measure as the gun had to be integrated on the T-34-85, but the time necessary in order to create the turret delayed its adoption. Other teams soon proposed the S-18 and the ZiS-53 for the same purposes. The three guns were tested at Gorokhoviesky Proving Grounds, near Gorkiy. The S-18 won the competition at first and its design was approved for use in the modified turret, but dropped when it was apparent that it was not compatible with the D-5 mounting for which the turret was designed. However, the D-5, conceived by Petrov, was retested and showed a limited elevation and other minor defects, but equipped the first production series (model 1943) of the T-34-85 as the D-5T. At the same time, Grabin’s gun, the ZiS-53 showed mediocre ballistic performances and had to be reshaped by A. Savin. On December 15, 1943 this modified version, named the ZiS-S-53, was chosen to be produced en masse and equipped all T-34-85’s model 1944. Around 11,800 had been delivered during the next year only. 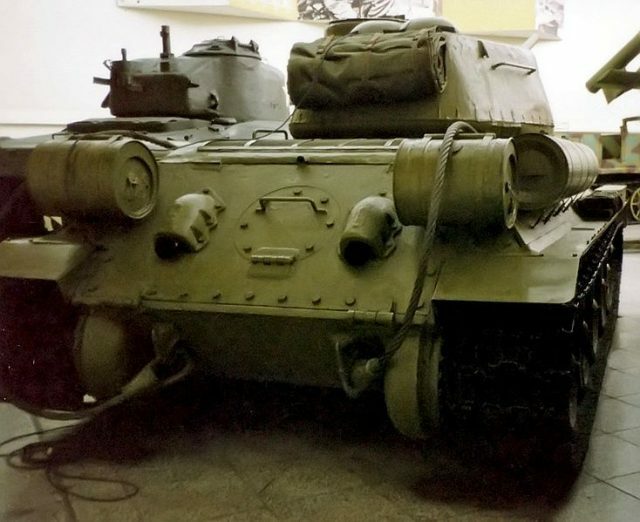 Rear view of a T-34-85, from Factory 174. Circular transmission access hatch, exhaust pipes, MDSh smoke canisters and extra fuel tanks cn be seen. By choosing either the D-5T or the ZIS-85, guns with a very long barrel and without a muzzle brake, the recoil dictated a very large turret, or at least very long. This roomier design also had the advantage of being roomy enough for three crewmen, the commander being freed from having to load the gun. This in turn helped him concentrate on possible targets and generally to have better awareness of the battlefield. The advantage of a three-man turret was already known by the British since the twenties, and the Germans found it very convenient for their main tanks, the Panzer III and IV. The advantages of such a configuration became obvious during the campaign in France. Having the commander free to focus on his tasks and excellent tank-to-tank communication gave them a clear-cut tactical superiority over the French, whose tanks mostly had one man turrets. This new turret, ordered by The People’s Commissariat for the Armor Industry, was partly based on the T-43’s turret and was hurriedly adapted by Krasnoye Sormovo Factory chief engineer V. Kerichev. It was a compromise design with a slightly reduced base ring, two periscopes and the commander cupola relocated to the rear, for full peripheral vision. The radio was also relocated, allowing easier access, better signal and range. Apart from the turret, the hull was almost unchanged except for the turret ring. It had to be enlarged from 1.425 m (56 in) to 1.6 m (63 in) to give a more stable and sturdy base, but this made the entire upper hull more fragile. The space between the huge turret and hull was also quite large and created natural shot traps. But the large hull supported quite well the added weight without excessive stress on the suspension and main body frames, a testimony to the ruggedness of the original design. Stability was not compromised, as trials at Kubinka showed. The hull was nonetheless reinforced and the turret frontal armor rose to 60 mm (23 in), like on the T-43. With an unchanged engine, transmission, gearbox and suspension, weight rose by only one ton (32 compared to 30.9 for the model 1943). Fuel capacity was augmented to 810 liters (215 gal), which gave a 360 km range (223 mi). However, since over time the weight continuously rose without any changes to the engine (the original T-34 model 1941 weighed just 26 tons), this lowered its top speed to just 54 km/h (32 mph). A clear gain appeared in terms of cost-efficiency. The new T-34-85 unit cost was 164,000 rubles, which was higher than that of the T-34/76 model 1943 (135,000), but still largely inferior to that of the model 1941 (270,000) and certainly far less than any completely new model would have cost. Production rose after the introduction of this new model, notably due to the opening of new lines in “Tankograd”. Since the hull parts of the model 1943 had been simplified, the new T-34-85 model 1943 inherited these, and deliveries rose to 1200 each month by May 1944, shortly before the launch of the most massive operation planned by the Stavka: Bagration. 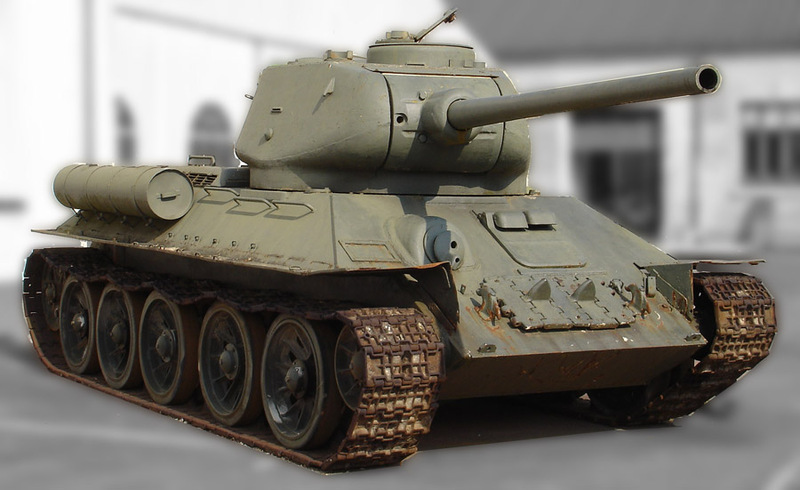 The T-34-85 model 1943 set the general appearance for the series, which remained mostly unchanged until 1945. It had a cast turret and deflector strips were later welded to the front to cope with the shot trap effect. This caused a shell to bounce of the sloped front and ricochet into the lower front part of the turret. The mantlet was 90 mm (3.54 in) thick. Inside, the gunner was positioned to the left of the gun. Behind him sat the commander and the loader to the right. Behind the commander cupola there were two smaller hemispheric cupolas, each pierced by five vision slits protected by bullet-proof glass. The early version was characterized by a two-piece hatch, while the 1944 version had a single piece one, opening to the rear. There were also two side pistol ports and vision slits above them. On the later version these were simplified and the vision slits eliminated. The loader had his own small hatch and two ventilators were located above the gun to extract fumes. The driver’s hatch had two vision slits and was his only access point into the tank. The late model 1943 turret could be recognized by its almost centered commander cupola and large periscope. The early 1943 production version and the 1944 model both had the commander cupola shifted backwards. They differed in the shape and configuration of the exhaust ventilators and the larger breech-loading equipment of the gun. The gun itself was activated through pedals and a small wheel. The breech block could be manually or semi-automatically operated. The recoil was supported by a hydraulic buffer and two recuperators. Both the gun and the DT machine-guns were activated with triggers. The gun mounting itself was easy to remove after dismounting the mantlet, providing easy maintenance. Aiming was performed with a TSch 16 scope, which had a 16° field of view and 4x magnification, and TSh-16 and MK-4 sights. This was still a bit rough compared to German equivalents, but a real improvement over previous systems. 35 rounds were carried (mostly AP with some HE), mostly stored on the turret floor and in the turret basket. Many model 1944s were also equipped with MDSh smoke emitters, placed at the rear of the hull near the exhausts. Trials also showed the tank had a tendency to pitch forward due to the increased weight of the turret. The first four vertical coil springs were reinforced accordingly. The model 1944 turret was made up of two massive cast pieces (top and bottom) welded together, with any other external and internal features barely changed. Only the length of the barrel and mounting could help distinguish them, as well as the turret top configuration. Most (late) model 1943’s had a periscope replacing the right ventilator, just in front of the commander cupola. The front hull was protected by 60 mm (2.36 in) armor, sloped at a 30° angle, giving an effective frontal thickness of 90 mm (3.54 in), while the sides had 45 mm (1.77 in) at 90°, and the rear 45 mm (1.77 in) at 45°. The turret face and mantlet were 90 mm (3.54 in) thick, with 75 mm (2.95 in) sides and 52 mm (2.04 in) at the rear. The turret top and bottom were just 20 mm (0.78 in) thick. The drive-train comprised a double rear drive sprocket, a front double idler and five double road-wheels of various types. The early production vehicles were given rubberized ones, but because of shortages the model 1944 had metal-trimmed spoked models, which became the norm. These gave a rough ride, despite the Christie type huge vertical coil springs, which probably reached the very limits of their potential. The engine was almost unchanged since the first T-34, still the reliable and very sturdy 38-liters water-cooled V-2-34 V12 diesel, which developed 520 hp @2000/2600 rpm, giving a 16.25 hp/ton ratio. It was coupled with the same old constant mesh all spur gear transmission (nearly obsolete), with 4 forward and 1 reverse gears and steering by clutch brakes, which were a driver’s nightmare. The best average speed obtained in tests was 55 km/h (34.17 mph), but the usual cruise speed was around 47-50 km/h (29.2-31 mph) and the best possible off-road speed was around 30 km/h (18.64 mph). 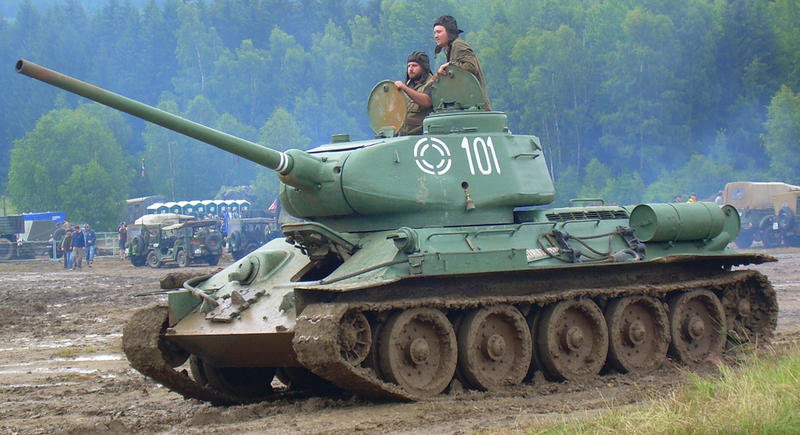 The T-34-85 was still quite mobile and agile, having a turning radius of about 7.7 m (25.26 ft). However, the range was somewhat reduced and consumption was around 1.7 to 2.7 km per gallon (1.1 to 1.7 miles per gallon) on a rough ride. The starter was electric as well as the turret traverse, served by 24 or 12-volts electrical systems. Secondary armament comprised two DT 7.62 mm (0.3 in) machine-guns, one coaxial, which could fire tracing bullets, and one in the hull, shooting through a ball mount protected by a heavy hemispherical shield. Ammo comprised between 1900 and 2700 rounds. The main gun could fire either APBC, APHE, HVAP and simplified AP rounds. The model 1943 was equipped exclusively with the original D-5T gun, while the model 1944 adopted the modified ZIS-S-53 (S for Savin). However, late models 1944 also adopted the improved model 1944 D-5T, whose development never stopped. It was capable of piercing 120 mm (4.7 inches) at 91 m (100 yards) or 90 mm at 915 m (1000 yards), placed at a 30° angle. The usual round weighed 9.8 kg and muzzle velocity on average was 780 m/s (2559 ft/s). The model 1944 L53/55 introduced on the model 1944 had slightly improved performances. The original D-5T barrel was 8.15 m (26.7 ft) in length and had a higher muzzle velocity, but the 85 mm ZIS-S-53 model 1944 L/51-52 was less complicated to manufacture. The elevation was kept unchanged at -5° to +20°. The early model 1943 had a hull mounted radio which was later relocated into the turret. Manufacturers of the model 1943 comprised Factory N°183 Ural Rail-Car Factory (UVZ), Factory N°112 Red Sormovo Works (Gorki) and Factory N°174. Together they produced most of the model 1943 tanks. The first ones were delivered in December 1943 and immediately given to one of the elite Tank Guards battalions. Production of the early model 1943 was around 283, while 600 model 1943’s and 8,000-9,000 of the model 1944 were delivered in 1944, and between 7,300 and 12,000 model 1944’s left the factory lines in 1945. It seems that a total of around 17,680 model 1944’s were built between March 1944 and May 1945. – The flame-thrower OT-34-85, mounting an AT-42 flame-thrower replacing the coaxial DT machine-gun, with a range of 80-100 m.
– The PT-3 mineroller, the mine removal version, a device which comprised of two rollers suspended under a pair of arms, protruding 5 meters in front of the hull. Each engineer regiment was comprised of 22 regular T-34’s alongside 18 PT-3’s (from “Protivominniy Tral”/counter-mine trawl). The engineers also used bridge-layer and mobile crane conversions of the chassis. When the first T-34-85’s delivered by Zavod #112 appeared, they were given to the best units, the elite Red Guards battalions. However, they were in training during December 1943, so it is uncertain whether they saw action before January or February 1944. By then, around 400 had already been delivered to front-line units and instantly became popular with the crews. They gradually replaced the T-34/76 and in mid-1944 the T-34-85 outnumbered the older versions. By then they formed the bulk of the tank units on the eve of Operation Bagration, the Soviet response to the Allied landings in Normandy, and the biggest offensive ever planned by the Red Army to date. This was the final push, aimed at Berlin. 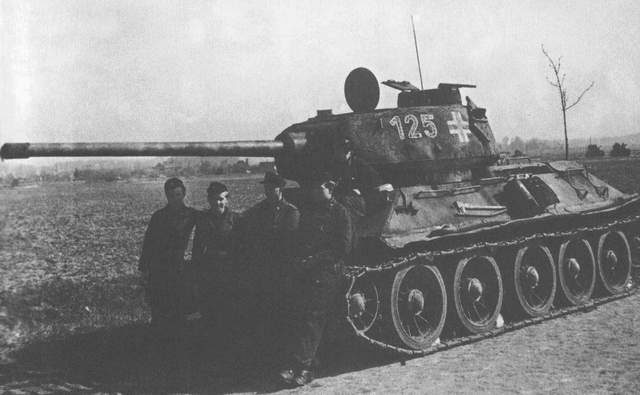 Before the production built-up, the T-34-85 model 1943 were usually given to chosen crews, usually of the Guard units. 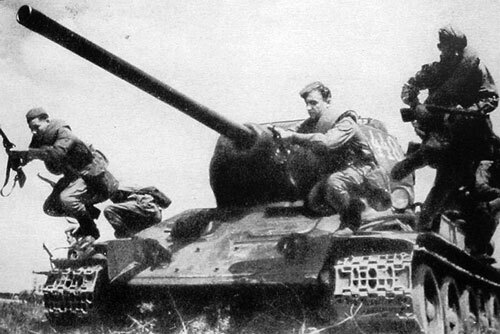 The T-34-85 took part in all subsequent engagements with the rarefying Panzer divisions, encountering a mix of Panzer IVs Ausf.G, H or J, Panthers, Tigers and many tank-hunters. There was no starker contrast than between the nimble and low Hetzer and the Russian model, towering relatively high above the ground. It was certainly not the tallest in use, the Sherman being taller, but the broad turret still made a relatively easy target when seen from the side, adding to the fact it was less sloped than the hull sides. Finishing was still rough and quality had deteriorated due to the lack of skilled manpower. Reliability, however, kept pace with their intensive use. They were still easy prey for many German tanks of the time, just like the previous T-34/76, but the high-velocity and range of the 85 mm (3.35 in) were clearly an advantage in many engagements. It scored kills at ranges of 1100-1200 m (3610-3940 ft), although better optical equipment and training would have probably increased this figure. The ZiS and DT were not really used at their full potential due to crews habits and tactical doctrine that still advocated trading range for penetrating power. By late 1944, when entering formerly occupied East European countries and Eastern Prussia, T-34-85 tank crews faced a new threat. This did not come from German tanks (although the Königstiger and many late tank hunters were quite impressive, if few in numbers), but from the average infantryman, even from citizen militias (Volksstrurm) armed with the Panzerfaust, the first shaped-charge launcher. To deal with this sneaky and effective weapon, the Russian crews took the matter in their own hands. They mounted makeshift protections made of bed frames welded on the turret and hull sides, but far enough from the hull itself to make the charge detonate sooner and spewing its high pressure metal jet harmlessly on the surface. This improvisation became usual during the battle of Berlin. This was not the last time the T-34-85 saw action, as in August, a tremendous build-up of forces was done on the Eastern frontier, on the northern borders of Manchuria. Aleksandr Vasilevsky attacked with 5556 tanks and SPG’s, of which over 2500 were T-34-85’s, alongside 1,680,000 men reinforced by 16,000 Mongolian infantrymen. To face the onslaught the Japanese (under command of Otozō Yamada) had 1155 tanks and 1,270,000 plus 200,000 Manchuko infantry and 10,000 Menjiang infantry. Compared to the Russian tanks, which had evolved quickly to match-up German technology, most Japanese models were largely prewar models, including many tankettes. The best was the up-gunned Type 97 Shinhoto Chi-Ha, but only a handful were available at the time and they were hopelessly outclassed by the T-34. 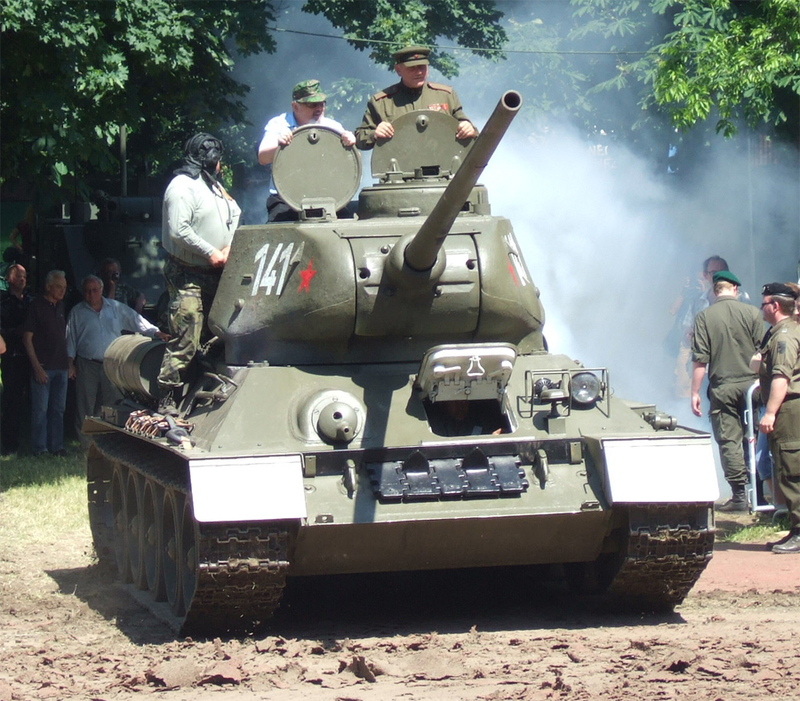 Although the T-34 production was stopped after the war ended, they were reactivated in 1947 in the context of growing international tensions in Europe. Perhaps 9,000 more T-34-85s were delivered around the clock until 1950 and another batch until 1958. When it was clear that the type was obsolete and already being replaced by the T-54/55, the production run ended for good, having turned up no less than 48,950 units. This, added to the estimated 32,120 T-34/76 already produced amount to a total of 81,070, making it the second most produced tank in human history thus far. Arguably, it was the great game equalizer of WWII (as stated by Steven Zaloga). This formidable reservoir of cheap tanks was then put at the disposal of the allies and satellites of the USSR, namely all the countries which had signed the pact of Warsaw. This included Poland (many had been delivered already in 1944 to the People’s Army of Poland, after Poland was liberated), with many other sent to the Romanians, Hungarians and Yugoslavians, not to mention the GDR after the war. Because of its small price and the many parts available, these tanks formed the backbone of many allied countries’ armed forces. North Korea received around 250 of these. A Korean armored brigade, comprising about 120 T-34-85’s, spearheaded the invasion of South Korea in March 1950. At that stage, SK and US Forces (namely Task Force Smith) had only bazookas and the light M24 Chaffee, later reinforced by many late Shermans, including the M4A3E8 (“Easy Eight”). More reinforcements quickly arrived and amounted to over 1500 tanks, also consisting of the US M26 Pershing, the British Cromwell, Churchill and the excellent Centurion. The latter was a generation ahead of the Russian tank and the T-34-85 had definitely lost the edge by August 1950. After the landings at Inchon, in September, the tide turned completely and around 239 T-34’s had been lost during the retreat. 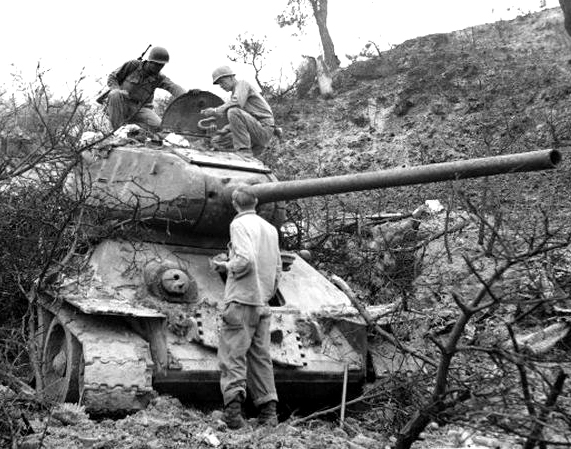 During this period, around 120 tank-to-tank engagements took place. In February 1951, China entered the fray, committing four brigades equipped with the Type 58, a licence-built version of the T-34-85. US Forces were given more and more HVAP rounds which proved very effective in many engagements against it. The list of users of this model is quite impressive. 52 countries, including the Finnish and German forces, all USSR client states (the last seen in action were in Bosnia in 1994), Cuba (many were sent to Africa to support popular uprisings in Angola and elsewhere) and subsequently many African countries also adopted it. During the Vietnam War, the North Vietnamese were equipped with many Chinese Type 58 tanks, but these were only engaged in the Têt Offensive and many late actions. Some were still used as far as 1997 (in 27 countries), a testimony of the longevity of the model. Many have also seen action in the Middle East, with the Egyptian and Syrian armies. Some were later captured by the Israeli. Others were part of the Iraqi forces during the confrontation with Iran (1980-88) and still in service when Saddam Hussein attacked Kuwait. It is not known whether any were still active by the time of the second Iraqi campaign and the war against Afghanistan. It is known that the Talibans possessed a few T-34’s. Bosnian T-34-85 with rubber plates, Dobroj, spring 1996. T-34-85’s sold to these countries had been modernized (mostly the breech loading system of the gun, better optics, new gearbox, new suspensions and model T-54/55 road wheels, new HVAP rounds, a modern communication system, etc). There were two campaigns, in 1960 and 1969, to sell the stocks from the USSR. By that time, the model was definitely considered obsolete and mostly kept in storage. Many have survived to this day, some in running condition in various private collections and museums. Their parts were used to repair or overhaul the SU-85, SU-100 and SU-122 derivatives. Many saw action in war movies, often extensively disguised to resemble Tiger tanks. One of the two prototypes of the T-43 designed between December 1942 and March 1943 by the Morozov Design Bureau, and delivered by Uralvagonzavod. These vehicles were up-armoured, had a new three-man turret (adopted later by the T-34-85), a new gearbox, new torsion arm suspension and other improvements. It was still armed with the usual F-34 76 mm (3 in) gun and was slightly slower. Because converting the factory lines for production of this model would be too costly and would add delays to the production, the project was canceled. T-34-85 Model 1943, early production vehicle from a Red Guards battalion, Leningrad sector, February 1944. T-34-85 Model 1943, early production version, Operation Bagration, July 1944. T-34-85 Model 1943, early production version, Red Guards Battalion unit, Operation Bagration, fall 1944. T-34-85 Model 1943, late production, fresh from the Red Sormovo Works at Gorki, March 1944. A T-34-85 model 1943 from the “Dmitry Donskoi” Battalion. This unit was raised through donations made by the Russian Orthodox Church. This unit was accompanied by several OT-34 flame-thrower versions (based on T-34/76 model 1943). 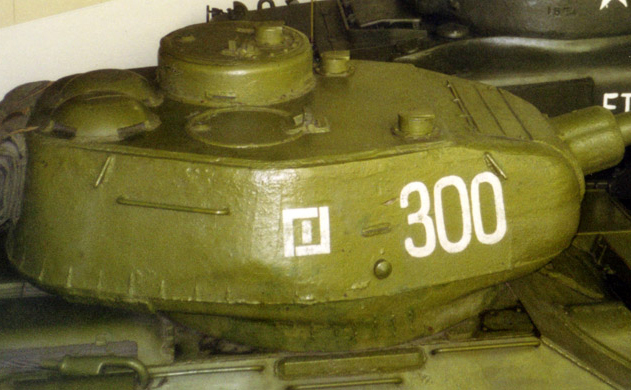 All of these tanks featured white livery and the “Dmitry Donskoy” inscription painted in red, February-March 1944. T-34-85 Model 1943 from the 3rd Ukrainian Front, Jassy-Kishinev (Iași-Chișinău) Offensive, August 1944. T-34-85 Model 1943, late production version, unknown unit, Southern Front, winter 1944/45. T-34-85 Model 1943, late production version, Third Ukrainian Front, Bulgaria, September 1944. T-34-85 Model 1943 from the First Belorussian Front, Warsaw sector, September 1944. T-34-85 model 1943, May 1945, Battle of Berlin. Notice the improvised protection made of bed frames welded over the turret. They were used to protect against infantry-held Panzerfaust weapons. Others were fixed to the hull sides, although these were partly protected by fuel tanks and storage boxes, and better sloped. The front mud guards were removed. This was often done when fighting in an urban environment and is testified by many photos. T-34-85 Model 1944 at Dukla pass, Hungary, October 1944. T-34-85 model 1944, 2nd Ukrainian Front, Battle of Debrecen, Hungary, October 1944. T-34-85 Model 1944 flattened turret model, Eastern Prussia, February 1945. T-34-85 Model 1944 flattened turret model, Budapest Offensive, winter 1944/45. 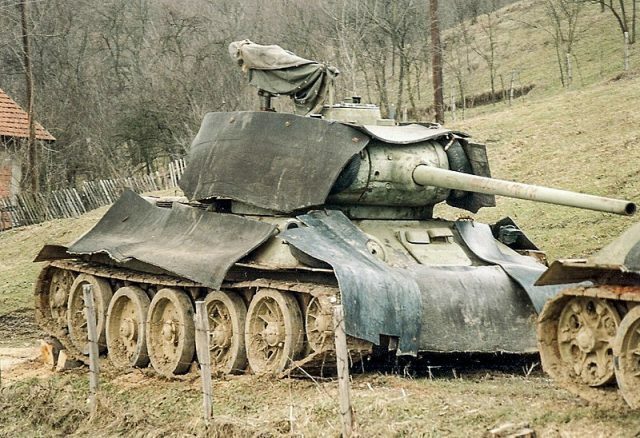 T-34-85 Model 1944 with curved mudguards, unidentified unit, with a rare improvised camouflage. T-34-85 model 1944, with spoked road wheels. The turret had red bands painted on top, intended for identification by friendly pilots. Unknown unit, North-East Berlin sector, April 1945. T-34-85 model 1944, sporting improvised wooden protection, Western Prussia, March 1945. A Polish T-34-85 model 1944, in action in Germany, early 1945. Hundreds of T-34-85’s were part of this new Polish “People’s Army” formed after the liberation of the country in late 1944, sporting the Polish eagle, but driven by Russian crews. 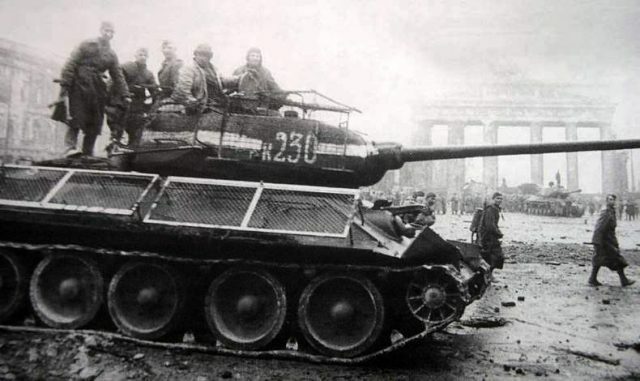 A T-34-85 model 1944 during the offensive on Berlin, March 1944, without mudguards, just before receiving additional protection against the “Faustniks” (Panzerfaust). T-34-85 Model 1944, rounded turret model, with additional protection against Panzerfausts, Southern Berlin sector, May 1945. 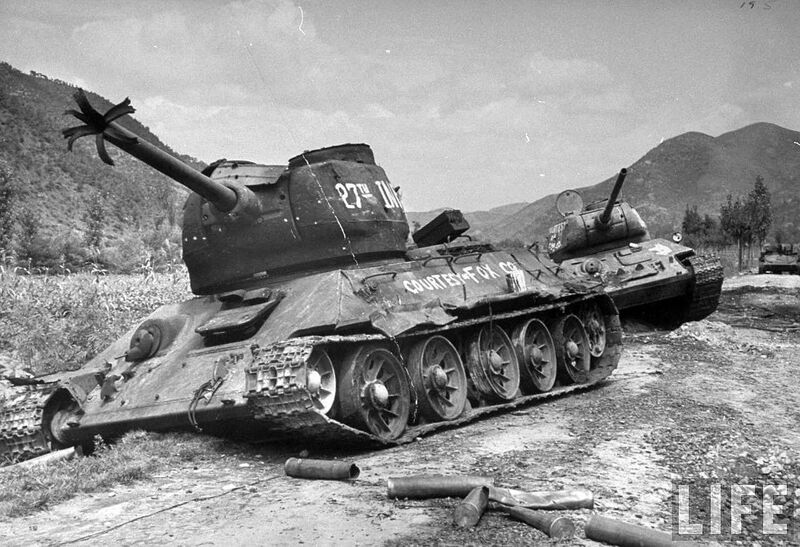 T-34-85 during the Manchurian Campaign, August 1945. An OT-34-85 of an unidentified unit, 1944. This was the standard flame-thrower variant. The hull machine-gun was replaced by an ATO-42 flame projector, capable of throwing napalm or other flammable liquids to a maximum distance of 100 m (330 ft). They saw extensive use against pillboxes and blockhouses throughout Germany. SU-100 tank destroyer: An evolution of the SU-85 based on the T-34-85 chassis, developed during the fall of 1944, and rearmed with a longer barreled, 100 mm (3.94 in) version of the D10 antitank gun, to keep pace with the new German tanks. About 2400 were built until 1945. Captured Finnish T-34-85, 1945, dubbed “Pitkäputkinen Sotka” (“Long-nose”, referring to the Common Goldeneye). Beute Panzerkampfwagen T-34-85(r), Frankeny area (near Furstenvalde) in March, 1945. Panzerkampfwagen T-34(r) from the Pz.Div. SS “Wiking”, Warsaw area, 1944. North Korean (Chinese-built) Type 58, 1950. Hungarian T-34-85 during the Hungarian Revolution, 1956. North Vietnamese Type 58, 200th armoured Regiment, Têt Offensive 1968. 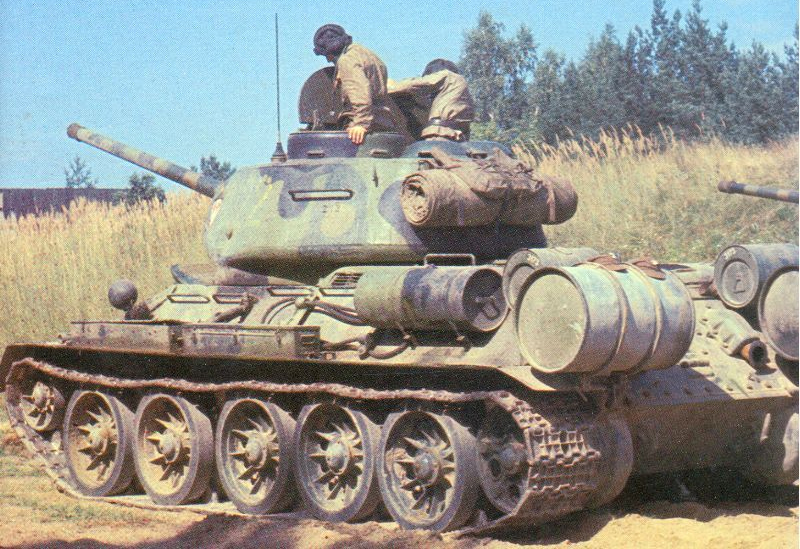 Czech-built Syrian T-34-85 of the 44th Tank Brigade, 1956 war. Iraqi T-34-85M (modernized), Iran-Iraq war, 1982. Maybe you can add new illustration for North Korea’s T-34/85. According to their latest military parade https://www.youtube.com/watch?v=PzPvhrh7gLM (skip to 36:38 for details) they modify their T-34/85 with T-54/55 drive sprockets and unknown type of tracks. Maybe my eyes are wrong, but it seems the tracks has rubber pads. Awesome find, I think you’re possibly correct. Definitely looks like a different type of sprocket wheel and rubber track pads. Yes, I just saw that vid, and it did look a bit different. Fixed. Well spotted, too. Often enough there’s a lot of bad info on statistics, etc on the internet. 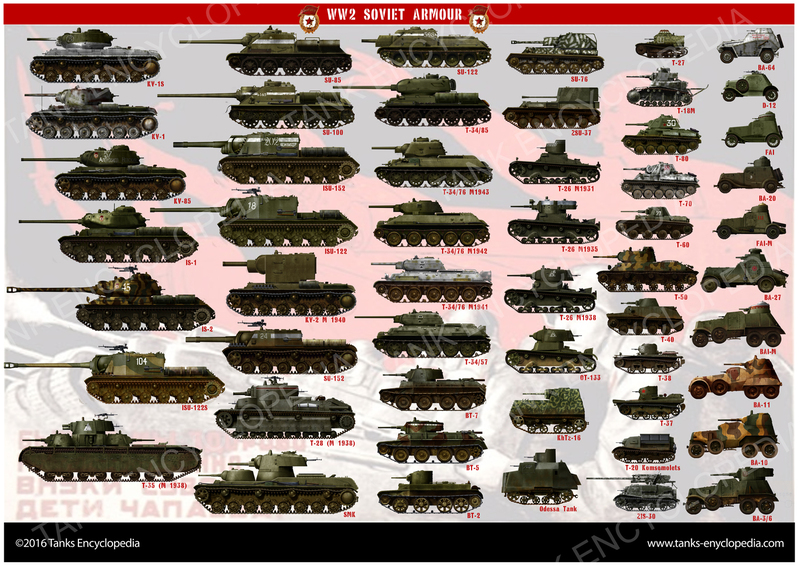 “Soviet Tanks and Combat Vehicles of World War Two” (Zaloga and Grandsen):L/W/H T-34/85 (M1944) 8.15m, 3m, 2.6m. For the record, Drabkin and Sheremet in “T-34 in action” suggest the barrel length for the T-34/85 (presumably S-53 as opposed to the rarer D5T stopgap) was 4.645m, and Onwar.com suggests it overhung by 2.05m. Quite a fair few discrepancies there between the sources. A lot of tank enthusiasts would live and die by Zaloga, is all I will say. What a fantastic reference! It is very much appreciated. Thank you for all your efforts! Just been reading through this and the entry on the Chinese Type 58. I’m pretty sure no Type 58s served with North Korean forces during the Korean War. 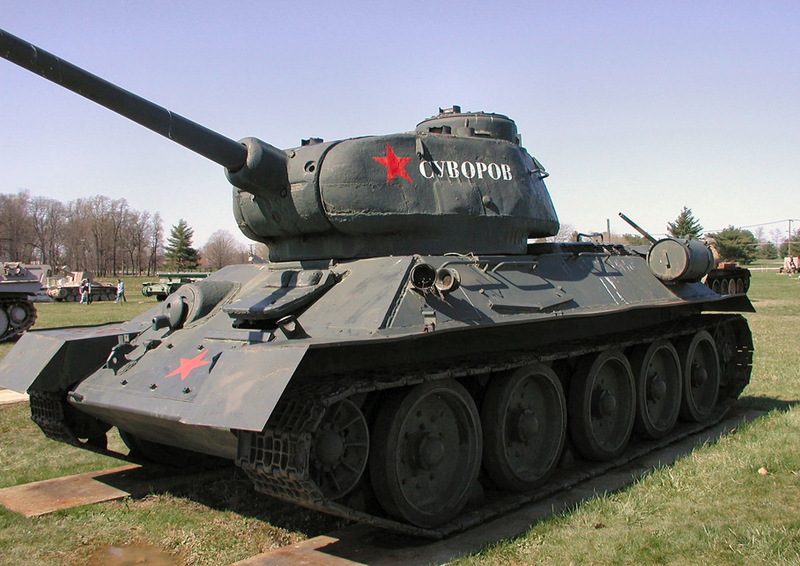 All tanks used by the North Koreans were Soviet built and supplied T-34/85s. Can someone direct me to a picture of a T-34/85 being used in Yemen recently? I am sure I saw it on this site but cannot now find it! These ones? I’ve also seen photos of one being fired using a cord. Could you help me, what type is this Tank? I know it is a T-34/85. I need to know the model and years it is. I am re painting it back to its military state. I am trying to work it out by looking at its wheels design. Please find link below. Thanks. Hello, your T-34 appears to be a Czechoslovak-built one, judging by how the turret was cast. Further inspection shows the infantry buzzer on the left rear of the tank has a metal cover, this confirms the tank was built in Martin, in present-day Slovakia. General consensus about this tank is that it originally served in the Czechoslovak Army during the 1968 Prague Spring. I think it is wonderful you are restoring this tank to its original condition; if you need any more help, feel free to ask. All the best, Harold Biondo. FIY, with reference to description for the tank used during battle for Dukla pass, a wrong country is mentioned. Dukla pass is located in the northeast of Slovakia. During WWII it was within territory of Slovak Republic (Nazi sattelite at that time) and not Hungary (even though we have lost some of the territory to Hungary). 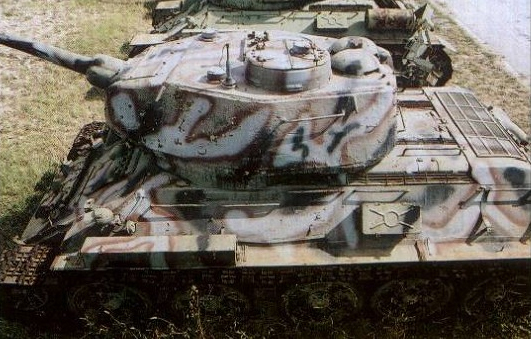 There has never been a Panzer IV Ausf. K.
That should have been a G, not a K. Thank you for pointing this out! Hey guys! I love your work. Could you maybe do drawings for postwar ARVs etc? The Specifications Table says the crew consists of 4. The T-34/85 usually had a crew of 5 did’nt he? 2. The profile entitled “Czech-built Syrian T-34/85 of the 44th Tank Brigade, 1956 war” is a bit confusing. What do you mean by “1956 war”? If this is a reference to the Suez Crisis of that year then Syria was not directly involved. If its a Suez T-34/85 then surely it should be Egyptian? Keep up the great articles and art work! Love your site!! I research tanks here and love the illustrations. You folks are first class! Thankyou. You actually raise an interesting point here, modern day Dukla is indeed on the border between Slovakia and Poland, however due to the Axis occupation and annexation of Czechoslovakia in 1938-9 the eastern area of Czechoslovakia (what would now be considered Slovakia) was conceded to Hungary. At the time of the battle of Dukla Pass in 1944 the area would have been considered ‘Hungarian’ territory and thus certain sources list it as so. Actually, those “certain sources” are completely wrong. Only a strip along the southern and eastern border of Slovakia were ceded to Hungary after March 1939, in the rest the independent Slovakian State was established. Dukla pass leads directly to Slovakia. The last time this area belonged to Hungary was in 1918, when in fact it was a part of Austria-Hungary. On (English) Wikipedia pages for Slovak Republic there is a nice map from 1943 of German origin where the Dukla pass is clearly marked.